Shares of Skechers USA Inc. rallied on Friday after the footwear giant reported earnings that easily topped Wall Street’s targets due to tight expense and inventory controls as well as targeted pricing actions. Gangbuster international growth continued while domestic wholesale growth recovered. On an adjusted basis, net earnings jumped 42.3 percent to $47.4 million, or 31 cents a share, beating Wall Street’s consensus target of 23 cents. Adjusted earnings in the year-ago period excludes a net tax expense of $99.9 million related to U.S. tax reform. The expense led to a reported loss of $66.7 million, or 43 cents, a year ago. Revenues advanced 11.4 percent to $1.08 billion. Sales increased 17.9 percent internationally and 4.1 percent domestically. On a constant currency basis, sales growth for the quarter was 13.7 percent. Gross margins increased 90 basis points to 47.7 percent as higher domestic margins from improved retail pricing and product mix offset foreign currency headwinds. SG&A expenses increased 7.9 percent in the quarter but was reduced as a percent of sales to 40.4 percent from 41.7 percent. Selling expenses decreased 3.2 percent and was reduced as a percent of sales by 90 basis points to 5.7 percent. G&A expenses increased $34.2 million, but was lowered by 40 basis points as a percent of sales to 34.7 percent. The increase in G&A expense was due to investments to support China expansion and an additional 47 stores year over year. For the year, sales were $4.64 billion, up 11.5 percent. Adjusted earnings improved 7.9 percent to $301.0 million, or $1.92 a share. Among its three channels, domestic wholesale business resumed growth in the quarter with an increase of 4.8 percent in the quarter, driving a gain of 0.8 percent for the full year. Domestic wholesale growth in the quarter fell short of guidance of high-single or low-double digits due as the off-price channel didn’t recover as much as expected, weaker than anticipated Kids’ business against difficult comparisons, and traffic challenges by its key wholesale partners. Domestic wholesale gross margins increased 140 basis points and were flat for the full year. “For the year, we maintained our position in the United States as the number one walking, work, casual lifestyle and casual dress brand and moved up to one position to be the third-largest footwear brand in the United States according to SportsOneSource,” David Weinberg, COO, said o a conference call with analysts. International wholesale business increased 18.4 percent for the quarter as a result of double-digit growth across its subsidiary, joint venture and distributor businesses. China “contributed significantly “ to the growth, gaining 21.5 percent or 27.2 percent on a constant currency basis. Including both wholesale and retail, international sales increased 17.9 percent for the quarter, and 19.2 percent for the year. International represented over 55 percent of sales in the fourth quarter. Wholly owned international subsidiary sales grew 14.4 percent and joint venture wholesale business increased 19.5 percent. For the quarter, significant dollar gains came from Germany, Spain, Japan and Peru within subsidiaries, and China, India, Malaysia and Singapore within our joint ventures. China remains the largest country within Skechers’ international portfolio with an annual sales increase of 29.1 percent and approximately 22.8 million pairs shipped in the full year. At the close of the year, China had 876 SKECHERS freestanding stores and 2,390 points of sale. Online sales jumped 53 percent increase last year. To support China’s growth, Skechers is planning to open a 1.6 million-square-foot distribution center and logistics facility that is expected to become operational in the second quarter of 2020.
International distributor revenues increased 19.7 percent in the quarter, primarily due to strong gains from Indonesia, Russia, Turkey and the Middle East. International distributor sales inched up 0.8 percent, overcoming significant headwinds in the first half of the year. 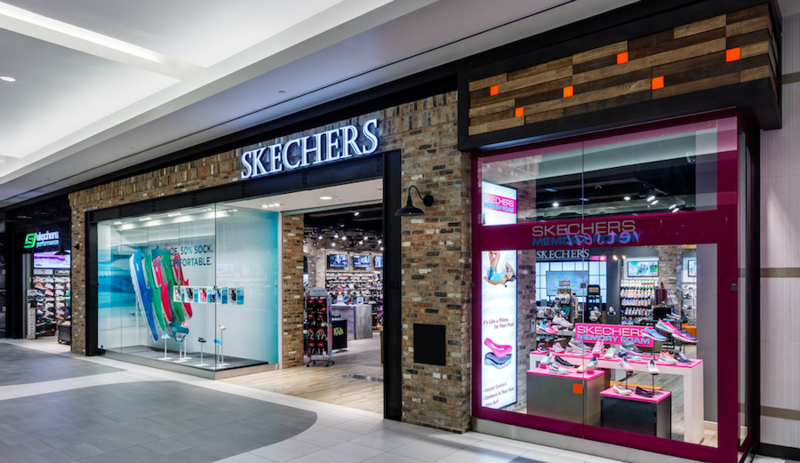 In Skechers owned global retail business, sales increased 7.5 percent in the quarter due to sales increases of 3.3 percent domestically and 15.9 percent internationally. N a currency-neutral basis, sales jumped 20.4 percent. Worldwide comps inched up 1.1 percent in the quarter with a 3 percent increase internationally and 0.4 percent domestically. For the full year, sales increased 12 percent due to an increase of 7.7 percent domestically 21.2 percent internationally. Domestically, gross margins climbed 450 basis points in the quarter and 160 basis points for the full year, due to improved pricing and a decrease in promotional activity. Domestic e-commerce business grew 8.9 percent for the quarter and 11.6 percent for the year. Improved functionality, accessibility and user interfaces will be launched this year and company-owned sites will reach more countries. Regarding its outlook, Skechers said it expects first quarter sales will be in the range of $1.275 billion to $1.3 billion and EPS in the range of 70 to 75 cents. The guidance reflects some foreign-exchange headwinds, a shift in some sales from the first to the second quarter, due to the timing of Easter this year, and newer investments in India. The year-ago period also included an unusual benefit of 7 cents a share from the tax reform.